Orlando: No blanket permit for smoke. But still! It’s been only two months since Orlando City Stadium opened its doors to supporters. Despite not being record-breaking in any way, this classic football stadium did gain attention worldwide, especially that of active football supporters. If for no other reason, it did for its great north terrace. Nicknamed the Wall, it houses 3,800 standing fans on a steep single tier located just behind the field (literally, 4.5 meters). It’s as intimidating as it can get and it offers more than just safe standing or podiums for capos. 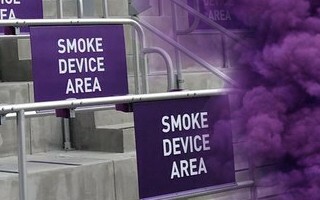 It also offers designated smoke device areas, which is exactly why it got European fans asking: how can this be legal? Well, it’s not simply legal, the list of requirements and restrictions is considerable. However, and especially in the light of recent events in Eindhoven, it seems a sensible policy agreed by both authorities and supporters could be the way to go. First of all, only the first 6 rows are included in the ‘smoke device area’. This ensures easy access with fire extinguishers, if needed. It also ensures that the smoke doesn’t stay under the roof, it instead disperses easily. What else was taken into consideration? “First and foremost, a Federal license is required to obtain a City permit through the Fire Department which itself has many requirements such as insurance, type of device to be used, location of the device while it is used, who is actually using the device, fire extinguishers, training and a designated fire watch which is an individual whose sole job is to monitor the safe use of the smoke devices. “There are also MLS and OCSC requirements that must be met. The type of smoke devices that are approved are done so for use only in specific areas, at specific times by specific individuals and this must all be listed in the permit package. There is no “blanket permit” that allows use of smoke devices at will. “There are many other things that are taken into consideration before any smoke devices are permitted and approved for use, these are just the highlights.” Kotscho ends.